The 15 Best Activities for College Students in Utah! With a surplus of competitive universities, Utah is home to a large student population with diverse interests and backgrounds. Fortunately, Utah offers plenty to entertain them when they aren’t studying. If you’re a student in Utah and bored on the weekends, these 15 activities make for enjoyable and creative boredom busters. An increasingly popular activity for those inclined toward the outdoors as well as those inclined toward Netflix, indoor and outdoor rock climbing options provide the opportunity for exercise, friendship, and adventure. Maybe not for those who are afraid of heights, Utah’s zip-lines are controlled excitement for collegiate-level thrill-seekers and nature-lovers. An experience unlike any other, swimming at Midway’s Homestead Crater feels like a fascinating dream or a scene out of a sci-fi movie. Best in groups, this activity is perfect for college students. 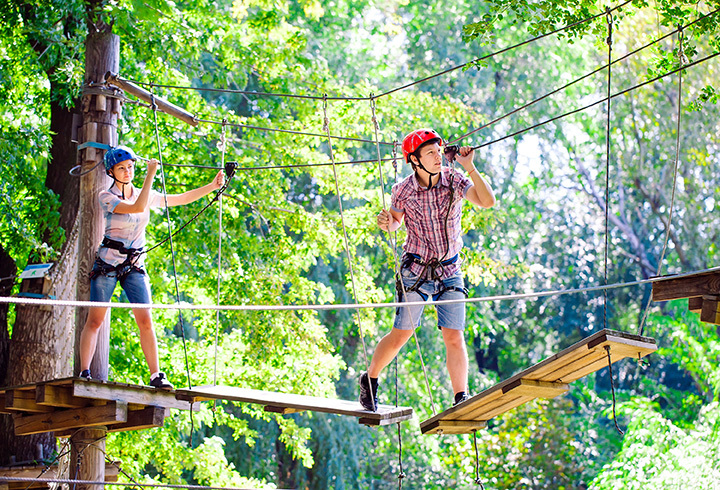 Similar to rock-climbing and zip-lining, Utah’s various rope courses (many of which are in Provo, next to Brigham Young University) strengthen camaraderie and test trust. Everyone wants to ride a Segway at least once in their life, so why not get a group of buddies together and take advantage of Thanksgiving Point’s beautiful gardens and a Segway ride all-in-one? Memory Grove Park falls under the radar of Utah’s most popular public parks, but that’s partly why it’s so magical. Especially nice if you’re looking for a spot for a romantic picnic, Memory Grove Park is situated just behind the State Capitol Building and leaves you feeling as if you’re in another world completely. For all the bookworms out there, The King’s English Bookshop is one of Utah’s quaintest. With the best books tucked into precariously situated nooks and crannies, exploring this bookstore makes for the perfect rainy day activity. Ocean Mart is one of the coolest places to shop in the state. Deemed the largest Asian shop in Utah, you’ll leave this place with a grocery sack full of interesting foreign snacks and treats to try. You can hardly be a student in Utah without attempting to ascend one of its towering peaks, and Mount Timpanogos is definitely one of the most impressive. Of course, this hike is very challenging and should only be attempted when weather is optimal and with plenty of fuel and emergency materials on hand. Spinning your own pot may be difficult, but painting a pre-prepared ceramic piece at Color Me Mine is not. In fact, it’s a wonderful way to destress after a demoralizing exam or even a way to celebrate after a particularly successful one. Utah is known around the world as a natural wonder. As a college student, you simply cannot afford to leave never having explored Utah’s national and state parks. Round up a group of friends to road trip a few hours south and you’ve got yourself a weekend of life-long memories. Utah State University in Logan and Brigham Young University in Provo are both proud of their respective dairy concoctions. Pretty sure your university’s ice cream is the best? Drive to the opposing school’s creamery to make sure you’re right. Forget uploading lonely videos to YouTube and participate in Open Mic Night at Velour Live Music Gallery in Provo. Here, famous bands such as Imagine Dragons and Neon Trees started their own musical careers. Even if you’re not serious about performing professionally, covering a popular song or attending solely for entertainment’s sake are both viable options. Some films are better watched at a theater and some of these films are better watched at an independent, indie theater venue. The Salt Lake Film Society’s Broadway Theatre is the perfect low-key joint for underground movie buffs. Your landlord may not be fond of pets, but that doesn’t mean you can’t enjoy the company of an adorable puppy for a few hours. Through Puppies for Rent’s services, the satisfaction of puppy cuddles at your home away from home becomes a comforting reality.